As a sculptor, my work is primarily made out of yarn, textiles, and found objects. The pieces are reflecting different concepts, different techniques, and different emotions. However, all of my works stem from a theme of integration. But one should keep in mind: it is not possible to experience integration without also experiencing separation. I was born in the United States of America, and raised by my Venezuelan parents who had both left their country, parents, brothers, and sisters to build their life. This information, without reference, is, as a matter of fact, very relevant to my practice. Being a first generation American is nothing extraordinary, as it is the country referred to as the “melting pot”. On the other hand, to be the first from a South American family to not be born and raised in South America alongside all of the cousins, aunts, uncles, and grandparents, is a bit more difficult to identify with as well as explain. Hundreds of situations in my lifetime thus far,(including now being an immigrant myself in Germany), have led me to thoughts of identity, belonging, and conformation. During my time studying Visual and Critical studies for my Bachelors in Fine Arts from the School of Visual Arts, NYC, I discovered a way to connect separate pieces of materials, joining them together through the process in which I became obsessed with: Weaving. 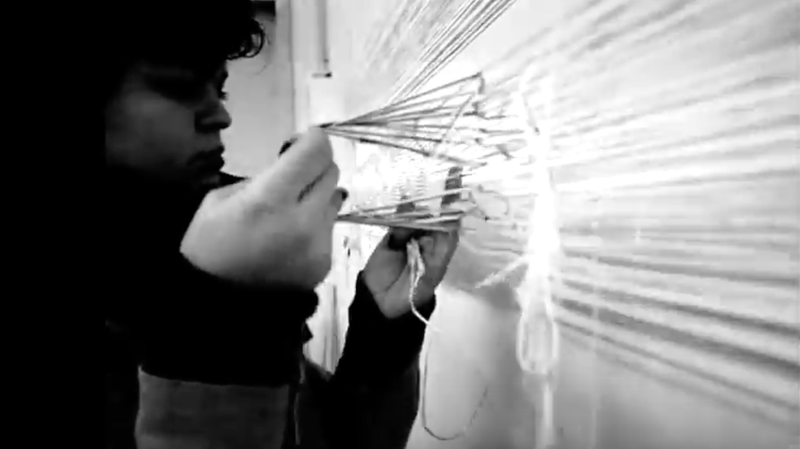 To weave is to create a pattern, or a story, using any number of disconnected (or interconnected) particles. An ancient craft, which has existed since 7000 BC, it is a method used to depict imagery and symbols for storytelling, creating decorative objects such as carpets and tapestries, and also building fabric for clothing. In my practice, I use many different techniques ranging from fiber art methods such as macrame, crochet, weaving, and sewing in order to execute my works. I never use glue to connect materials, I find the challenge to use only my hands, yarn, and few other materials to create sculpture momentous and powerful. The materials I use are also minimal; in my works I do not work with more than three materials in one sculpture, which are typically all neutral colors. The realization I attempt to leave on the viewer is fragility within a composition, by creating works that seem physically or structurally unsound, impossible, too delicate to touch, but also hard to resist handling. The focus’ of my work remain as technique, monotony, and repetition utilized to create a common ground between materials; the potential grandiose or flamboyance of structural weaving is not what interests me. The tactility of the process and the visual appeal of my works come hand in hand, and is what viewers are drawn to. What I am interested in is creating a mirage: something that at first glance may seem effortless, but after observation, the realization of the arduous work behind the object becomes clear. The outcome is a symbol for our world; gathering inspiration from how we connect to one another within a greater society, or I may focus on how we integrate within our religions, families, or cultures. Weaving allows me, as an artist, to symbolically narrate elusive moments we as humans experience within the domain of our own identity. My finished pieces manage to look as if they had always been unified. I use these methods because my work is inspired by my own placement within society. I look at a sculpture like I do a universe; together, with all the different strands, a new “body” is formed. The way the piece hangs, the way it looks messy or organized, sturdy or illusory, forgotten or realized, is the end statement I hope the viewer can read and understand.